Are you thinking about teaching genealogy? A few years back I was contemplating the same thing and ultimately decided to pursue it. Although the road has had a few detours, I’m happy to say that it was well worth it. 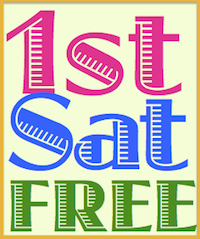 There were two main reasons that led me to teach a genealogy class for the first time: my early training in genealogy at the California Genealogical Society (CGS) and my volunteering at a senior center. 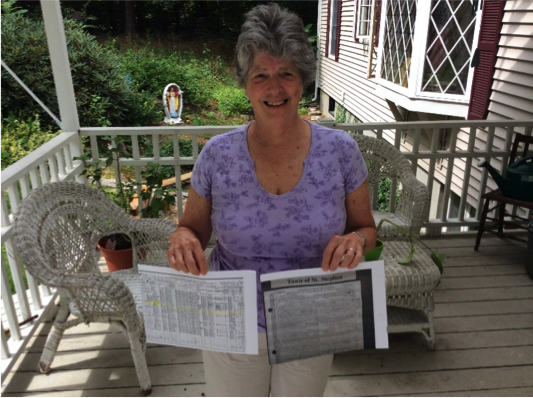 A couple of years ago this blog published The Path to Becoming a Genealogy Educator: Part I. Now, I am happy to share Part 2 of the route I took to becoming a genealogy educator. 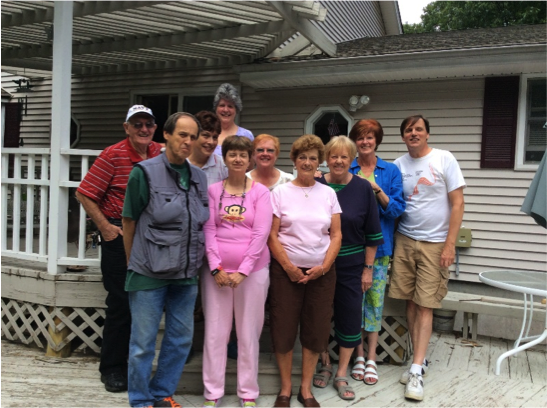 In this segment, I tell about my second genealogy class being taught in an adult education community, and I conclude with a story about special students of mine. In 2012, I moved to Massachusetts from Oakland. While there, I got the opportunity to teach my first genealogy class to a wonderful group of seniors in Auburn, Massachusetts. This experience gave me the energy and enthusiasm to find my next teaching opportunity. After two years of living, working and teaching in central Massachusetts, it was time for me to be closer to my family in southern Maine and help with things there. After moving and settling in, I did some networking with the local adult education program that led to my next genealogy class. 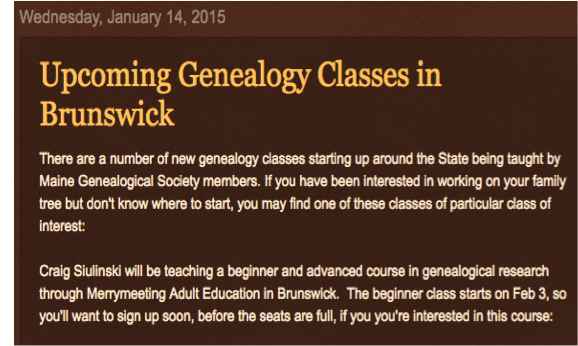 The posting shown above appeared on the Maine Genealogical Society’s website. 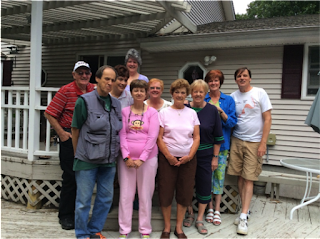 The Brunswick class was taught through the Merrymeeting Adult Education program and had five students with varying degrees of genealogy knowledge. 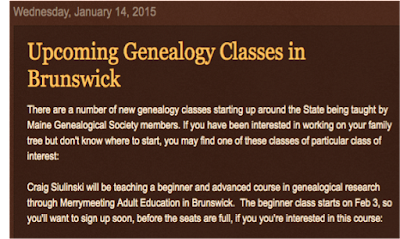 The class got extended several more weeks to explore more advanced topics in genealogy. While in Maine, I decided to formally start my own business, Sharing Legacies. I chose the name because the idea of sharing family stories is so important to me. I firmly believe that “every life story is a treasure to preserve for generations to come.” Particularly with technologies available to us today, our life stories can be converted into easily sharable formats and preserved for future generations. I've been back in the Bay Area since 2015 and continue to further my genealogy skills and teaching opportunities. My latest class at CGS is Life Story Writing, Enriching Your Family History, which focuses on how writing autobiography excerpts can enhance and enrich your family’s history. You will learn how your own personal stories will empower both yourself and your family's narrative. Shirley Dano was one of seven genealogy-enthused seniors who entered my classroom at the Auburn Senior Center. When it was Shirley’s turn to introduce herself and her reason for taking the class, she told of knowing virtually nothing about her family history. Shirley Dano holding up her first two found records. Both her parents had passed in the late 1990’s and she only got to know one of her grandparents, her paternal grandmother, who died when Shirley was only 15. It was exciting for me to have someone in my class who knew so little because with such a clean slate, the sky is the limit to what can be learned from both conventional and innovative genealogy practices. What has teaching taught my students and me? What a difference one class makes! I have spoken to Shirley twice now this spring and in both calls she spoke with vigor and confidence, and at length, on what she has learned since that first day in 2014. Shirley continued the trips to the library to use Ancestry after the class ended. From a shared family tree connection on Ancestry, she was able to connect with a distant relative who told Shirley that the great grandfather she never knew captained a schooner from Newfoundland to Bermuda. She also learned that her grandfather was born in Nova Scotia but moved to St. Stephen, New Brunswick. A culminating event happened before I left Auburn, Massachusetts that summer. Donna Wrenn, another student from my first class, hosted a potluck at her beautiful home for all the genealogy students. From this experience, I am convinced that lasting friendships were formed which, for me, was the most gratifying aspect of teaching the class. Discovering new things about our ancestors is the impetus that pushes us forward to research, take classes, attend conferences and use the internet resources so readily available to us at all hours of the day and night. But the real value of a genealogy class is the relationships that result from shared connections and students helping each other make their discoveries. Craig Siulinski is an experienced K-12 educator teacher and is currently working as a Learning Specialist at Stanbridge Academy in San Mateo, California. In his off time, he is devoting as much time as he can to researching, writing, and developing his business plans. He holds a Master of Science degree in Education from Cal State University East Bay, and a Bachelor of Science degree from the University of Southern Maine. Documenting family stories and researching genealogy have been Craig’s passions since 2007. His first blog called August Legacy, was dedicated to his maternal grandfather, Auguste "Gus" Albert. Craig has led classes and workshops to encourage others to use blogs for publishing and sharing their family histories. He has also been a conference speaker on the importance of doing location research and is currently developing genealogy presentations on the topics of Polish History and the Loyalists of New York and Canada.